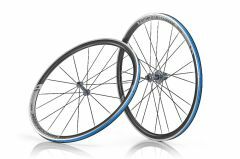 American Classic's 420 Aero 3 wheelset is stronger than ever for serious riders and racers. They are the best do-it-all wheels on the market, strong enough for racing or training. The new lightweight high–low hub flange is engineered to carry balanced spoke tension on all spokes for increased side to side stiffness and strength. The 3 spoke lacing groups result in consistent spoke tension and share the load equally for increased wheel durability. The 420 rim is the lightest deep section clincher rim in the world with technology designed by Bill Shook. Improved braking surface. Low spoke count bladed spokes shave weight, boost aerodynamics and stiffness. The rim profile and bladed spokes slice the wind to hold your high end cruising speed. The ride is fast, responsive and smooth with great accelerating properties, brisk climbing and speedy descents.